In the last blog I outlined something of the history of moving mental health care from a hospital setting to the community. 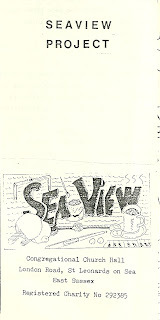 As a result of this shift, the Seaview Project came into being. Many local charities throughout the country were started by individuals, or a group of individuals who had an affinity with particular needs, and wanted to do something to help meet those needs. So many problems arrived in the community as a result of Government policy, and it was left to local people to try and pick up the pieces. During the latter part of 1984, a small group of two to three people (I won't be mentioning any names, as I don't have their approval to do so, and if in later blogs I do mention names, those names will have been changed) met to discuss the concerns that they had, particularly for the St Leonards on Sea area. In looking at the fallout from the gradual closing of Hellingly Hospital, they saw former patients who had been moved to Hastings and St Leonards on Sea wandering about with nothing to do, and nowhere to go. They were also concerned about the plight of those that they described as "socially stranded" through unemployment, bereavement, physical and stress related illnesses etc, and felt that something must be done. Through personal experience of mental illness, either through suffering it themselves, or seeing members of their family suffer, they decided that starting a Day Centre would be the way forward. In talking to one of those concerned, they were reminded of the enthusiasm and energy that they had at that time. 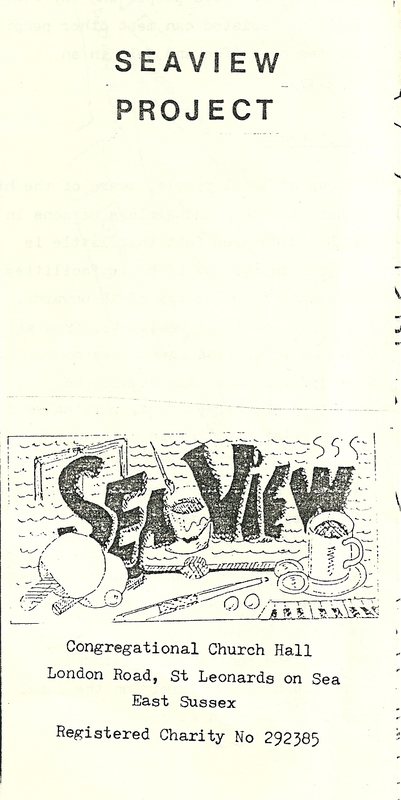 There is no doubt that without that, there would have been no Seaview Project. It is worth noting why there were so many socially stranded people in Hastings. There has been a long-term mis-understanding of the South of England, with the general view that everywhere is wealthy. While it is true that much of the area is well-heeled, there have always been pockets, particularly on the coast, of extreme deprivation. Hastings historically has been one such place. While millions of pounds has been poured into the town over the years, with undoubtedly some improvements to the town's infrastructure, it has made very little difference to the socially stranded who live there. In the latest Indices of Deprivation (IMD 2010), Hastings is the most deprived town in the South East, and the 19th most deprived local authority area in the country (out of over 350). This is a worse position than in 2007 when Hastings was ranked 29th. The town remains the 2nd most deprived seaside town in England after Blackpool. A similar situation would have been facing the group who were contemplating what to do. So, a Day Centre was opened on the 4th February 1985, to which anyone over the age of 18 would be welcome. 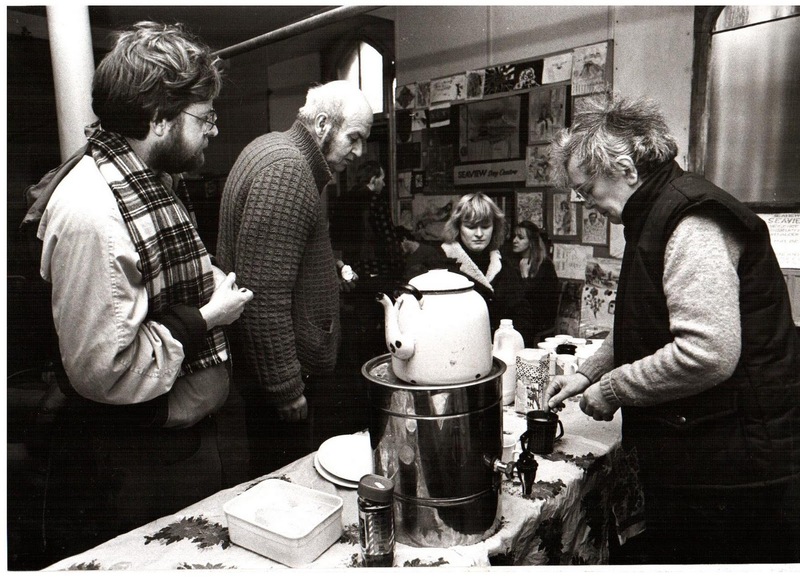 According to their first promotional leaflet, the Day Centre would be "a place where people who may feel lonely or isolated can meet other people; have tea or coffee, and join in an activity". It was to be "a friendly environment, where social and creative activities would be encouraged". But where would this Day Centre be? Fortunately, help and support was at hand. 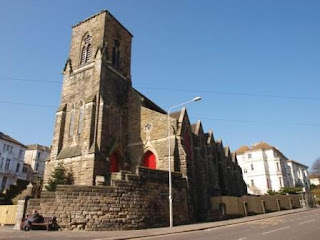 The Congregational Church on the corner of London Road and Pevensea Road in St Leonards on Sea made their hall available. Let me digress slightly from the story by telling you something about this Church. It was founded as a Congregational Church in 1863, and was considered by English Heritage to be "one of the most ambitious Non-conformist buildings in Sussex". The building was subsequently listed as Grade 11 for its architectural and historical importance. In 1972, the Congregational Church in England and Wales joined with the Presbyterian Church of England to form the United Reformed Church (URC). While technically at that point the Church became a URC Church, it was always known as Pevensea Road Congregational Church. It has basically stood empty since 2008, and comes up for auction on the 1st November 2011. It was in this Church hall that Seaview Project began, and it wasn't long before it had firmly established itself on the local scene. No one should underestimate the time and effort required to get such a project up and running. There was furniture to find, equipment to get, and people were needed to run the place. During most of the first year, the day to day running of the Centre was undertaken by one full-time, and eight part-time voluntary helpers, plus two Community Programme workers, who were funded by the Manpower Services Commission. Having relied on the commitment of volunteers for most of my life in social care, I cannot speak too highly of the work these few people did to get the Seaview Project established. Within a year, a three year grant had been secured from the Consortium on Opportunities for Volunteering Scheme, which began on the 1st April 1986, and enabled the project to appoint two part-time, paid Co-ordinators. I think that the picture above gives an idea of how basic the hall was. It wasn't very bright, the furniture was second-hand, and it was filled with smoke. Because the hall was shared with the Church, everything had to be cleared away every night and the hall cleaned. 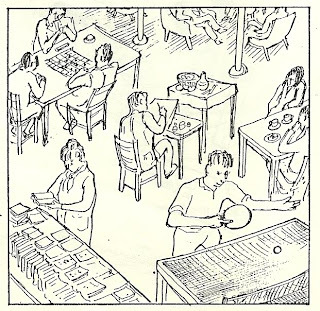 But in spite of its condition, the hall was warm, welcoming and comfortable, and this was all that people were looking for, as this was what they were lacking in their lives outside of the Centre. 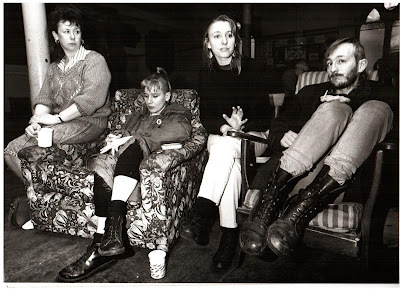 In later years we would modernise the new place with functional furniture and fittings, but I'm not sure that it could ever have matched the atmosphere of that early place. Some people imagine that such a Centre as the Seaview Project is a place full of people borne down by their problems, and living a miserable existence. 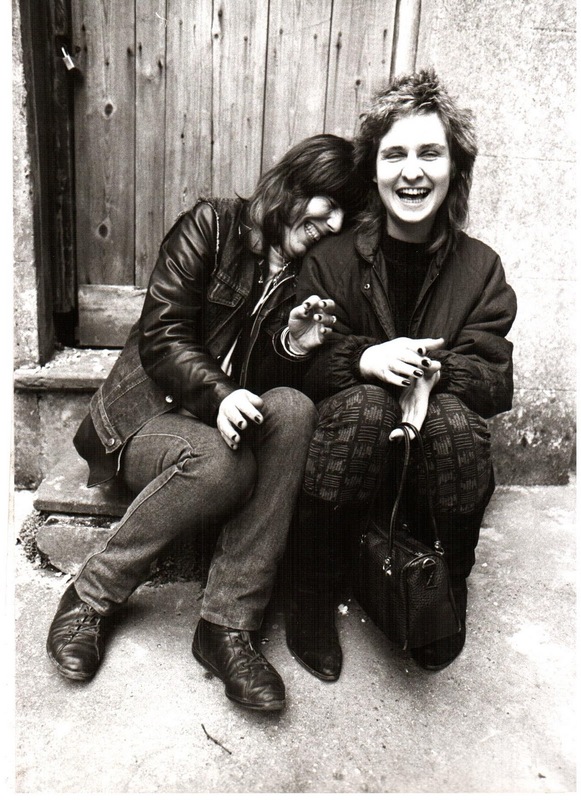 While it's true that the vast majority of people attending the Centre had major issues in their lives, I can say from later experience that I have rarely laughed, or enjoyed myself as much as I did with so many of those clients. The mix was young and old, male and female, and every form of sexuality imaginable. To those, the place had become home - a home that many had never had before, and it's to the great credit of those early volunteers and paid staff that this was so. If I was to ask you what you thought was the most important part of a Day Centre, I wonder what you'd say? My view has not changed in over 20 years. It's the tea bar. 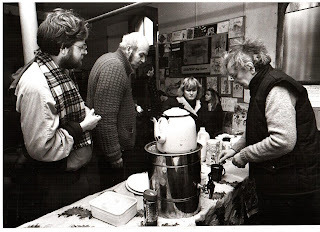 In the Church hall there was no kitchen to speak of, so a make shift bar was erected "where tea, coffee and light snacks were available at very reasonable prices". This was also the first point of contact for new visitors, so everybody could be given a welcome, and those requiring help could be directed to the appropriate person. It was the place for banter, and for catching up with news. It was the hub, and remains so to this day. 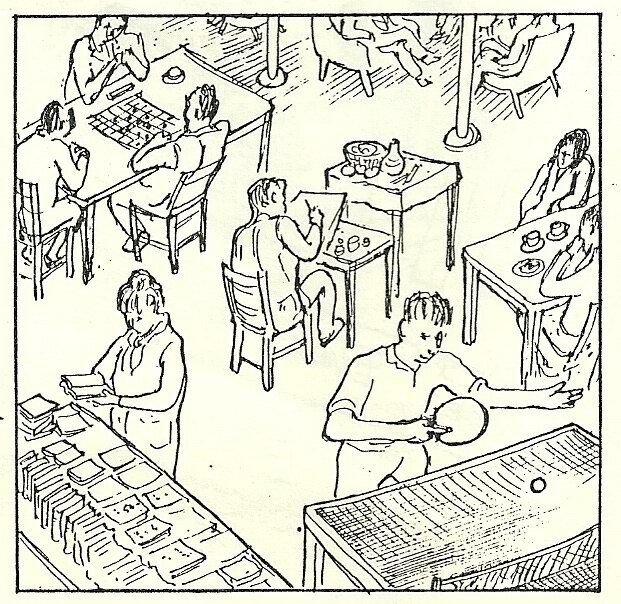 Believing that people should be able to enjoy themselves at the Centre, and be stimulated as well, they provided table tennis, a range of board games as well as creative activities such as art, music, poetry and books, either to borrow or buy. The Centre grew in popularity and usage, with numbers between 40 and 50 being recorded each day. The vision of those who began the project, of providing a place for those who find themselves to be socially stranded, had come to fruition. In fact the need that was being met, was far greater than they had originally envisaged. The people with diverse needs and problems mixed together, and often provided mutual support, which evidenced good working class values of the role of community. This was in stark contrast to the Thatcherite vision of the importance of the individual, culminating in her statement that "there's no such thing as community". Yes there was aggression, fights and other displays of anger, and who could blame those who were down trodden, but these were dealt with, and everyone moved on. The Seaview Project was clearly providing a service, and meeting a need, and doing it very well. After four years of sharing the Church hall, it was felt that if the organisation was to move forward, it needed a place of its own, and the process began to find such a place. We'll pick up the story from there next time, and that's when I joined the Project.